Japan Bowl® – The Japan-America Society of Washington, Inc.
More information can be found on the official Japan Bowl website. The Japan-America Society has a special responsibility to the next generation of Americans, to help them learn about Japan as a country of its language, its history and culture, and its relationship with the United States. 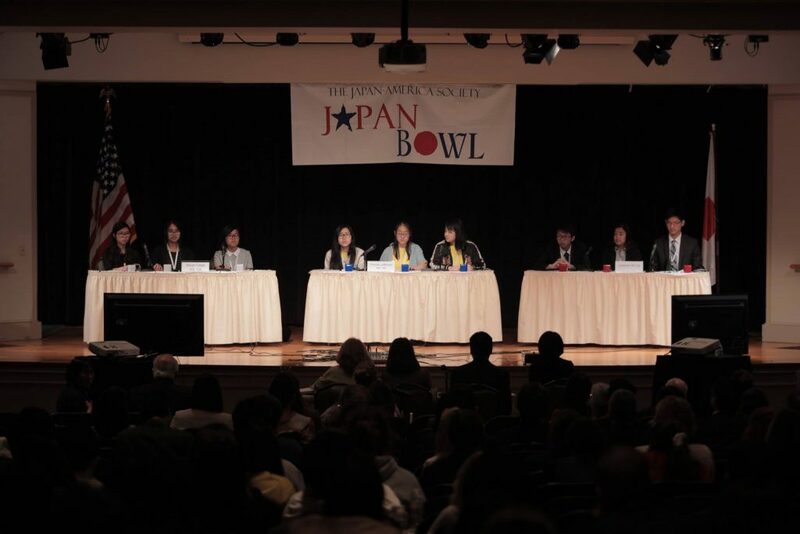 The Japan Bowl® was created by the Japan-America Society of Washington DC in 1992. It is an academic competition that tests the achievements of high school students throughout the United States who are studying the Japanese language. But the Japan Bowl goes beyond language. It also tests the student’s knowledge of Japan, the country. The National Japan Bowl® competition is held each spring. The format is modeled on popular quiz shows such as “It’s Academic.” Teams from across the nation compete for two days at three different levels, depending on how long they have studied Japanese. The National Japan Bowl® also includes a variety of cultural activities outside the competition room. In years past, the students have joined cultural workshops that feature activities such as calligraphy and origami. Students have learned how to wear a kimono and play the koto. They have met sumo champions and famous Japanese musical artists. Through the Japan Bowl®, the Japan-America Society and its many supporters recognize and show appreciation to those high school students from across the United States who have chosen Japanese as their foreign language. On April 6 and 7, 2017, the Japan-America Society of Washington DC held the 25th National Japan Bowl® in Chevy Chase, Maryland. This year, 170 students from 27 schools came from all over the United States and its territories, as well as a team from the Mexico Japan Bowl. New York, Connecticut, Maryland, Virginia, Florida, Illinois, Kentucky, Minnesota, Wisconsin, Utah, Texas, Oregon, California, Guam, and Mexico were represented. JASWDC congratulates the winning teams of the 2017 National Japan Bowl, the West Coast Teacher’s Team, winners of the the first-ever Teacher’s Round, and all of the participants. The Level 4 winning teams will be awarded a trip to Japan thanks to the generous support of the Mazda Foundation. This PowerPoint is from a presentation made to high school Japanese language teachers at the 2014 National Japan Bowl® by Amb. John R. Malott, the President of the Japan-America Society of Washington DC. It is aimed at parents, school administrators and others who question the importance of learning Japanese today.This presentation may be used freely to promote and advocate Japanese language study, but please give proper credit to the Japan-America Society of Washington DC.